Fireworks explode during WrestleMania 33 at Camping World Stadium in Orlando, Fla. This Sunday night, all eyes in the wrestling and entertainment world will be on the Mercedes-Benz Superdome in New Orleans for the 34th edition of the biggest wrestling pay-per-view of the year, WrestleMania. 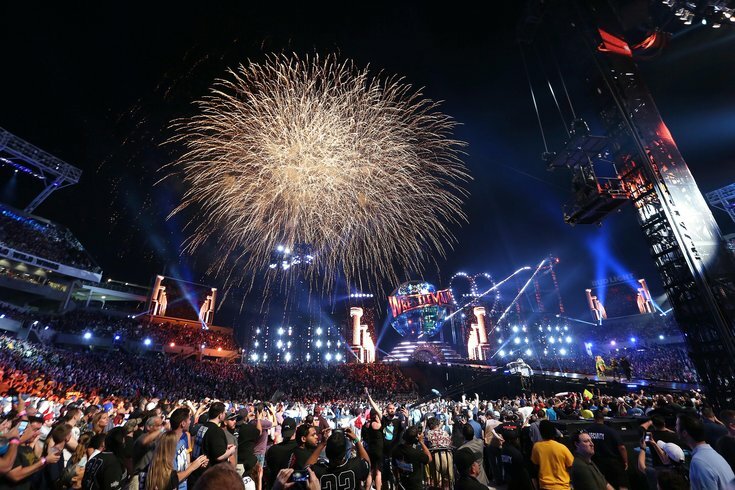 Just four years after hosting its first WrestleMania, New Orleans was lucky enough to win a bid to host another one this year. Next year, WrestleMania will return to MetLife Stadium, after hosting the event for the first time in 2013. Needless to say, WWE’s bread and butter is seemingly becoming well-known now when it comes to their biggest show of the year. We’re still waiting for Philadelphia to win a bid, but as each year passes, it seems like hopes dwindle. What a year it would have been for Philly to host Sunday’s WrestleMania, however. In what could be described as one of the best-built cards in WrestleMania history, Sunday night will surely go down in the annals of history as being one of the most anticipated events in memory. Every match has had good-to-great build, which is something that hasn’t really happened with a pay-per-view of this magnitude since the last time WWE visited New Orleans for a WrestleMania – the night Daniel Bryan won the WWE World Heavyweight Championship after two grueling matches. Scheduled participants include: Dash Wilder, Scott Dawson, Baron Corbin, Mojo Rawley, Tye Dillinger, Matt Hardy, Dolph Ziggler, Fandango, Tyler Breeze, Goldust, Heath Slater, Rhyno. While garnering its WrestleMania moments, this match has become more of an entertainment aspect than an actual character build aspect. The last three winners have been Big Show, Baron Corbin and Mojo Rawley, respectively. And all three have pretty much done nothing of note since their big wins, save for Corbin’s Money in the Bank win in 2017. But, ultimately, that also led to nowhere. So instead of thinking WWE will really use this to push a new talent to the top or even the midcard, I’ll just go for the entertainment aspect and pick someone who isn’t even advertised for the show as of now. I thought they’d try and place this on the main card, being the first-ever WrestleMania Women’s Battle Royal, but I can’t say I’m surprised that they’ve decided to slot this for the Kickoff Show. While some may see it as a slight, the Kickoff Show will also air on all WWE social media platforms and the USA Network, so more eyeballs will be on these three matches than usual. I’m hoping this event proves different from the men’s battle royal and the winner is made to look and feel important and not just a throwaway. For that reason, I’m going to go with the feel-good pick in Becky Lynch, with Banks and Bayley eventually main eventing an upcoming pay-per-view. 205 Live has really gained a lot of steam after Enzo Amore was fired and forced to vacate the Cruiserweight Championship. The tournament to crown a new champion has resulted in some great matches and a surprising final. Both of these guys are deserving of the title, and they’re both babyfaces at the moment, so it should be an awesome match and great finish for the New Orleans crowd. Ali has really come into his own, especially with the promos he’s created for himself on social media. It seems like WWE likes that, and this could be his chance to lead the Cruiserweight brand. I think he does it. I said it before and I’ll say it again – I can watch the Usos and New Day tear down the house every single night because their matches are straight fire. But the addition of the Bludgeon Brothers just kind of ruins it for me. I like Harper and Rowan, but adding them into the mix for this feud just kind of doesn’t hit with me. And for that very reason, I think they’ll walk away with the titles. At least Braun Strowman is on the card, right? I wrote back in January that WWE should pull the trigger on a Strowman push to one of the world championships to culminate at WrestleMania. He was that over with the crowd, and I didn’t think he’d become an attraction unto himself yet like the Cenas and Undertakers of the world. I still don’t think he’s there yet, but if they’re not going to give him a run with one of the world championships yet, I guess a secondary title is a good enough consolation prize. Of course, a singles title probably would be better, but I digress. Strowman’s supposed to have a mystery partner, and he’s having some fun with it. Needless to say, it’d be criminal to give Strowman a loss here. And I’m sure there are some humorous segments awaiting from Strowman and his partner as tag team champions. Randy Orton was wrestling for the WWE Championship at last year’s WrestleMania, and now he is here defending the United States Championship one year later. In what some might consider surprising, Rusev’s the most over guy in this match and I don’t think any other outcome other than him winning back the United States Championship can happen. Rusev’s cheers are near deafening levels now on television, and he’s made “Rusev Day!” very popular. He’s a pseudo-heel right now with babyface reactions, so it wouldn’t surprise me to see WWE try to go full-force with a babyface turn for this guy. He should have a run at the top once again. Mahal and Roode are kind of just there to be there. Neither of them do anything for me, and it seems like neither of them do anything for the crowd. With Jason Jordan being sidelined due to injury, it’s cool to see Rollins in a match of this magnitude on the biggest stage. Sure, he’s been WWE World Heavyweight Champion before, and I’m sure he’ll be at the top of the mountain soon again, but I don’t think there can be a loser in this match. All three of these guys have proven their value not only to the company, but to the audience. They are all fantastic wrestlers and deserve to be in the main event spotlight. After these last few months, I cannot believe Seth Rollins isn’t the face of this company. He’s big enough and a fantastic athlete to make the face of WWE. Even when he was WWE World Heavyweight Champion three years ago, he wasn’t really the face of WWE. He’s proven time and time again how great he is inside the ring, and he can be an excellent ambassador for WWE outside the ring. And the crowd would rather he was the guy rather than Roman Reigns. So why not give it to them? I’m actually big on a Rollins vs. Reigns match headlining SummerSlam, and because that’s not very far away in WWE terms, I don’t think he’ll get the gold on Sunday. I do, however, think the title changes hands. One of the most forgotten stories from last year was Jax turning on Bliss, in what sort of became a weird dichotomy with Jax as the heel and Bliss as the babyface for a short time. Then, that entire angle was forgotten. But here we are now, a story in which Jax has to put up with Bliss’ bullying about how she looks. Even though we’ve seen angles like this before, this time, the payoff has to be different. Jax has to defeat Bliss clean in the middle of the ring and the story has to be that good overcomes evil. It’s really that simple. Some of the best stories are the ones that mimic real life situations. Make no mistake, the story they’re telling with Jax and Bliss mimics real life. It’s empowering for Jax to not be ashamed of her body and a good lesson for everyone to not worry about what people think or say about you. Harder said than done, for sure, but this storyline seems like it will end the way real-life situations do. Is this the biggest women’s match in WWE history? I could definitely see the case being made. At first I didn’t see it, but Flair is already a future Hall of Famer and so is Asuka. I’m not so sure we’ve seen a match of this magnitude, ever, in WWE. Yeah, we’ve had Trish Stratus vs. Lita and Alundra Blayze vs. Bull Nakano, but the spotlight was never as big as it is now for these women. Streak vs. Title. There’s probably never going to be another streak like the one Asuka is on right now. Flair has been the best Women’s Champion WWE has had since maybe Stratus. She’s main-evented pay-per-views. She is the gold standard in WWE right now. So, yeah, this just might be the biggest women’s match in WWE history. As good as Flair is, I just don’t see Asuka’s streak ending before she wins gold. It very well could happen, and it would make for an interesting story – Asuka finally gets the big match but can’t win it over the veteran Flair – but I still think WWE’s got plans for Asuka to finally lose. And, heck, it may be courtesy of a Carmella cash-in. Imagine that. Asuka’s first loss coming from a heel turn by Flair and a successful cashing-in of the Money in the Bank briefcase by Carmella. Just imagine. Nuclear heat. Nuclear. When WWE announced Bryan was cleared to return to in-ring competition, I literally almost cried. Those following his story – from learning he wasn’t going to be cleared by WWE doctors again, to his retirement, to his bout with depression, then to his return as an authority figure on television – they would have probably felt the same, too. Bryan is beloved unlike any other athlete has been in WWE before, and it’s because he literally leaves it all out there in the ring every time he competes. Now he’s back. Sure, he may have to change his style a bit to avoid unnecessary risks. In fact, he should. He'd better. As for the outcome of this match, I could see a scenario play out to where Bryan is making Owens or Zayn tap out, but they’re not the legal guy, as the other pins McMahon. I mean, they can’t have every single babyface win on Sunday night, can they? In a rematch of Wrestle Kingdom 10 that saw Nakamura defeat Styles to retain the IWGP Intercontinental Championship, who would’ve thought we’d see the same match play out at a WrestleMania, as a main event no less? Certainly not me. The build for this match took a while to really get going, but due to their sheer talent, it wasn't necessary. It’s a babyface vs. babyface main event and the real winner is us, the fans. The last few weeks has told a great story that both guys could have hit their finishing maneuvers against each other, but bailed at the last second to get into the each other's heads. Sure, we’ve seen this type of story before in wrestling, but it’s still a classic. Styles is WWE’s safe plan. He’s proven one of the best in the world, so I think that this match for Nakamura signals his peak for the company right now. But I don’t think he’s walking away with the title. I want him to, but my gut is telling me WWE’s happy with keeping the belt on Styles for now. A few months ago, nobody wanted to see this match. Including yours truly. But it’s a testament to the creative team to really make Lesnar vs. Reigns one of the most anticipated matches on the card. And they went in a type of real-life direction to build this angle, and it’s working. Reigns being angry that Lesnar gets all these perks while being a part-timer is likely how a lot of the people in the locker room feel, despite being a big draw. Imagine them giving their all night in and night out and someone comes in once in a while, maybe four times a year, and gets the preferential treatment. That’s the real-life scenario playing out before our eyes right now in this story. This isn’t exactly a rematch of WrestleMania 31’s main event. People are actually behind Reigns thanks to this storyline playing out. As awesome as Lesnar is, his aura has kind of worn off. He’s been back in WWE for six years. People are tired of part-timers. And with the rumors swirling that Lesnar will return to UFC, it’d be ridiculous to consider anything other than a Reigns win. Hey, crazier stuff has happened, but I’ll stick with the popular choice. I’d argue this is probably the biggest match of the night. Rousey is on the biggest show of them all and it’s time for her to finally get into her groove. I’m not going to say it’s easy, and I’ve never been in that position before, but Rousey’s had more than enough time to acclimate herself to WWE from than what she’s been used to in UFC. That’s not to say she shouldn’t be nervous, because I’d bet every single person on the roster is nervous, but now is the time to silence the critics. Rousey’s going to need a good performance to bring some legitimacy to her WWE run. She’s still learning on the fly, much like others have. She didn’t have an NXT run to fine-tune anything. She debuted in January at the Royal Rumble in Philly and has had little time to really dig in. In the wrestling world, a few months isn’t a very long time. But she’s surrounded in this match by the best professionals possible. With Angle and Triple H in there, they’re sure going to try to make Rousey look like the monster she can be in the ring with a style different from MMA. She’ll play a factor in the ending of the match, which I’d bet on making McMahon tap out. As of this writing, this match hasn’t officially been confirmed for the pay-per-view, but it’d be crazy to think it’s not happening based on the last few weeks of television. For multiple weeks now, Cena has come out on television and social media trying to goad The Undertaker into accepting his challenge to a match on the biggest stage. And nothing he’s done has worked. Yet. If this match does indeed happen, I’d expect Cena to get the win. While much of the luster of a match of this magnitude is gone due to their part-time status, it’s still a big match that will go down in history as being one of the biggest WrestleMania matches. That by itself makes it a pretty cool thing to see.